The transition to digital television seems to have netted its first arrest: A 70-year-old man who shot his TV set in frustration when he couldn't get his digital converter box to work. The incident happened in Missouri, where the man was charged with unlawfully discharging his weapon -- his wife told the local news that he had been drinking. I understand his frustration after watching the digital TV transition this weekend. We went to visit my husband's disabled great aunt who has four ancient TVs in her apartment that are not connected to cable. 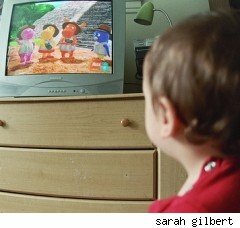 Usually, when we go over there, my daughter sits there glued to a slightly-snowy broadcast network watching movie reruns on weekend afternoons -- a rare treat for her because we never let her watch commercial TV at home. But on this last visit, my husband connected up two digital TV converter boxes (we could only get two boxes, because the government ran out of money for the program and we have two wait to get her two other boxes). After he plugged in a few cords, he TV in the living room suddenly got a crystal clear picture, something it had never had before. And then it promptly froze. Then the picture pixelated, stuttered, came back on and then froze again. With the TV connected to the building's rooftop antenna, the box picked up about 7 English-language stations, but pretty much the only ones of interest were CBS, NBC and ABC. The TV in the bedroom, which has rabbit ears, fared a little better in terms of reception. But my uant was none too happy, in the end, with having to learn a new remote and ending up with even fewer channels than she had before, despite the momentary clarity. Since so many homes in this country are connected to cable or satellite and are bypassing any distress for this transition, people like my aunt and her TV viewing aren't a top concern. But there are millions more like here out there, and like the man who shot his TV, so the furor may just now be starting to announce itself. Come summer, when the full transition takes place, watch out if you walk by a tall building ina neighborhood full of the eldery or the infirm. You may be hit in the head with a falling TV.